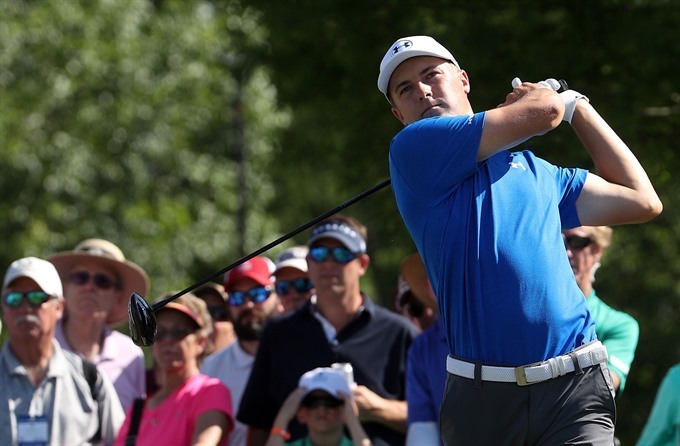 LOS ANGELES — World number-five Jordan Spieth and fellow American Ryan Palmer combined for a six-under-par 66 in alternate-shot play on Thursday to grab a share of the lead at the PGA Zurich Classic. Spieth sank a 15-foot birdie putt on the par-5 final hole to lift the Texas duo to the top of the leaderboard alongside Australian teen Ryan Ruffels and American Kyle Stanley at the TPC Louisiana course near New Orleans. The event shifted to a pairs event this year with 80 two-man teams playing alternate shot in the first and third rounds and better ball format in the second and final founds. "It looks like wind might pick up tomorrow afternoon, you never know," Spieth said. "But alternate-shot format with these conditions, anything 3 under or so was a solid score. Grab a few extra and be in obviously pole position, it’s fantastic," he added. "We’re just going to try and have as much fun as we had today. We’ll get out there tomorrow and try to get as many putts as we can in the wind." Spieth and Palmer birdied three of the last five holes, Spieth holing out from 36 yards at the par-3 14th and Palmer knocking in a five-foot birdie putt at 16 after having made a six-footer for birdie at the par-5 11th. They also birdied the course’s other par-5 holes, the second and seventh. Back-nine starters Ruffels, an 18-year-old born in Florida to an Aussie father, and Stanley, whose lone PGA victory came at the 2012 Phoenix Open, reeled off four consecutive birdies to begin their round, Stanley sinking a 19-foot birdie putt at the 10th and Ruffels dropping a 24-footer two holes later. Stanley missed the green off the tee at the par-3 17th and then a 15-foot par putt for their first stumble, but they rebounded with a run of four birdies in six holes on the front nine, starting at the par-5 second and ending at the par-5 seventh. But on their final hole, the par-3 ninth, Stanley again missed the green and a 22-foot par putt, the subsequent bogey leaving them on 66. Sharing third on 67 were South Koreans K.J. Choi and Charlie Wi, Americans Ben Crane and Ben Martin, Aussie Cameron Smith alongside Swede Jonas Blixt and the US pair of Charley Hoffman and Nick Watney. England’s Ian Poulter, who lost full PGA playing rights last week, and Aussie Geoff Ogilvy were sharing 11th on 69.